A promising report on China's hotel industry helped GreenTree Hospitality stock post big gains last month. 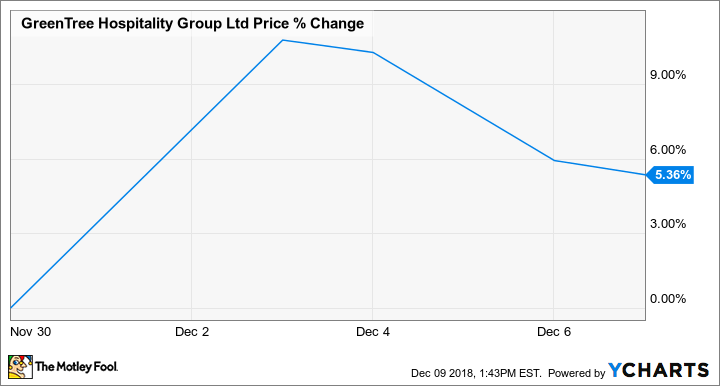 Shares of GreenTree Hospitality Group Ltd. (NYSE:GHG) climbed 39.3% in November, according to data provided by S&P Global Market Intelligence. The Chinese hotel operator's stock gained ground early in the month following a report suggesting strong momentum for the country's hotel industry. GHG November price change. Data source: YCharts. Comments President Trump made on Nov. 1 suggesting that a trade agreement between China and the U.S. could be forthcoming likely also contributed to GreenTree's big stock gains. The company primarily operates hotels in China, and ongoing trade tensions are seen as an obstacle to maintaining economic growth in the country. 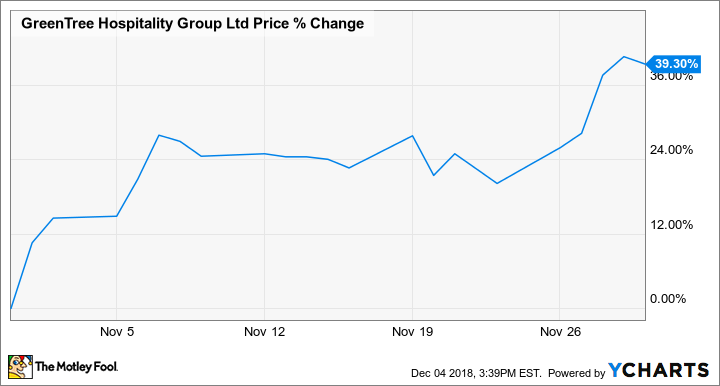 However, it appears that some encouraging developments on that front combined with more specific hotel industry news helped push the company's valuation higher last month. A joint report from American Express Global Business Travel and China International Travel Service on the hotel industry was published on Oct. 31 and found that business travel spending allocated to domestic trips in China increased 18% in 2018 against the comparable period in 2017. The report suggests that business activity is increasing in China's tier-two and tier-three cities and bodes well for the hotel industry. Following the report and an improved outlook for a trade deal between China and the U.S., GreenTree stock continued to climb in the lead up to the company's third-quarter earnings release on Nov. 19. Sales for the period climbed 21.6% year over year to reach roughly $37.4 million, and net income from the company's core business rose 30.3% year over year to reach roughly $18.2 million. The company had 2,558 hotels in operation at the end of the September quarter -- up from 2,434 hotels at the end of the prior-year period. Occupancy at its hotels in the third quarter came in at 87.2%, down 0.2% from the third quarter in 2017, but not cause for alarm given that the company opened more than 120 new locations over the stretch and increased its average-daily room rate 4.4% year over year. GreenTree stock's momentum has continued into December, with shares up roughly 5.4% in the month as of this writing. GHG December price change so far. Data source: YCharts. At the end of the September quarter, the company had more than 500 new hotels contracted or in development, indicating an aggressive growth plan. GreenTree hasn't issued guidance for the fourth quarter, but it expects full-year sales to arrive within the range of its previously issued guidance for growth between 20% and 25% compared to 2017. The stock is still down more than 40% from the high that it hit in June, but it trades up roughly 5% from its March initial-public-offering price.